Ride on the chalk highway and reinforce following directions, building coordination and learning colors. 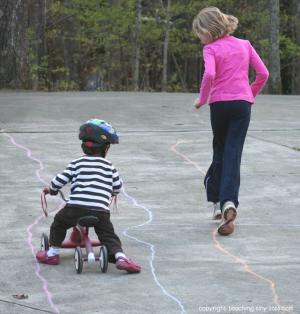 Draw a track using colored chalk. Depending on age and skill of child you can make it straight or with curves. Direct your child to ride a certain color track from beginning to end. Have your child practice safety skills like looking left and right even if it's just in your driveway. Great time to reinforce good safety habits. Got a push truck or a little wagon? 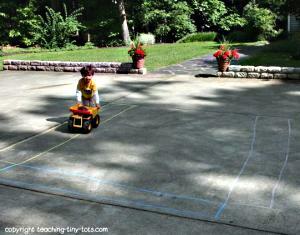 Reinforce colors by instructing your child to drive on the red track or blue track. Make a wavy path for a fun ride! Build coordination and following directions skills. 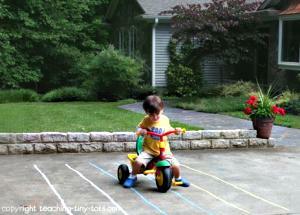 Use directional language and if your child is a proficient rider, let him follow a particular colored line. Encourage your child to some fun competition and challenge him or her to a race! This activity will build coordination, gross motor skills as well as reinforcing learning to follow directions. According to the CDC each year, more than 500,000 people in the US are treated in emergency departments. Children are at particularly high risk for bicycle-related injuries. So while many of us never wore helmets as children, why not provide that extra protection to minimize injury for your child. Do a little research on helmets to find one best suited for your child and if you are not familiar with bike helmets, I would highly recommend getting it fitted at a bike shop or sporting goods store to learn about proper fit and how to adjust the straps properly.